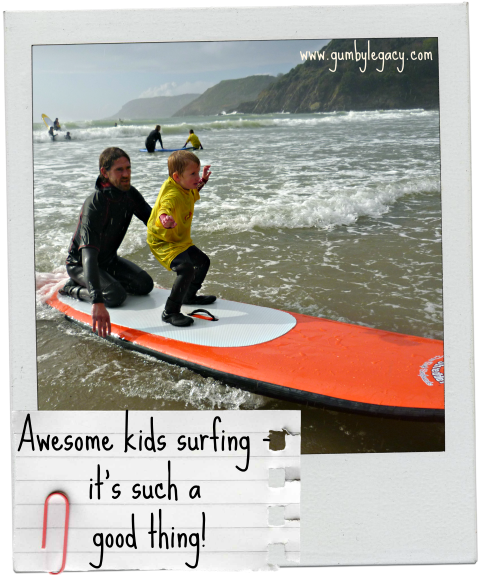 You are here: Home / Projects / Fundraising / Awesome kids surfing – it’s such a good thing! 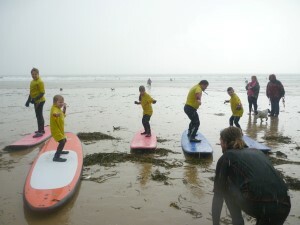 This weekend is the last session for our first 8 surfers and fair play, they have been incredibly awesome! Not to mention the committed and supportive parents! The weather on at least two of these Sundays has been pretty miserable to say the least but they all still arrived, smiling, cheerful and motivated to get in the sea with Ben and his team from Surfability CIC UK . In fact, feedback so far from parents has been extremely positive, especially regarding motivation. All the children look forward to their sessions and for at least two, it has been found to be useful as a reward activity for positive behaviour. A ‘warm up’ was definitely needed on this rainy day! For others, they found that they were actually able to get out as a family and enjoy a family outing together, something that is usually fraught with distractions and difficulty. Strength, co-ordination and balance have improved with a few getting up to their feet, but I think the overall, resounding hooray! has been that every single child has become more confident in their own ability to achieve. 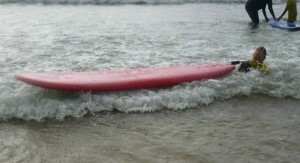 Surfing is one of those sports I think we’d all agree, it would be AWESOME to do! It’s just so cool! Imaging being able to go out in the sea – confident, poised, strong, enjoy the vast peacefulness that is the ocean while waiting for a wave, then feel the rush as it takes you in towards the land. I imagine it might feel a bit like flying. It might feel like there is nothing on earth that could stop you from doing anything. Of course, it might feel cold, wet and a bit uncomfortable if you fall but then I think they all loved that bit too! The point is, besides the many physical benefits that children with special needs can get from surfing, it is a cool, ‘normal’ thing to do. It is not something that all of their friends can do. Many of them probably haven’t even tried it. We all respect the person who tries something awesome first. These kids are getting that respect. Wow! I hope they get hooked on the feeling and surfing is just the first thing they try. They deserve that feeling. I think for many parents it can be difficult to find an activity that gets their children up and about. We all know how important it is for kids to do physical activities but there’s only so much bribery, threatening and pleading you can do! At the end of the day, if the child isn’t keen, you can’t physically force them to do it. Or if you try, the resulting stress from the sulking, tears and tantrums just isn’t worth it. How do you protect your child from ignorance and hurt, but teach them that they have just as much right as anybody else and empower them to be, do and feel, whatever their heart desires? I am so proud to have been a part in helping these children and their families try something new. Something my brother Gumby loved so passionately. He would be so chuffed! Fundraising efforts have gone really well and we are extremely grateful for all of the support so far. We still have enough funds for three more blocks of six sessions but want to keep giving children opportunities like this for as long as we can so please donate and help to build up a kids confidence!